Fashion is a phenomenon which keeps on evolving with time. We all might not be very conscious of the ongoing fashion changes but it keeps moving on and on. Fashion changes are not only confined to clothes, but a lot of fashion is defined by the accessories that we choose to wear as well. While woman have the privilege of showing off clothes with the latest trends, men do not show much interest in it.Women have a lot of accessories to wear and flaunt but men seldom wear any. The only accessory which men still wear are bracelets. Be it a bracelet embedded with gold or silver or the coolest of all leather bracelets. Leather bracelets have some style quotient in them which makes them look cool when worn in the wrists of men. Leather bracelets were a rage to a fashionable man years ago and it has made a ravenous comeback in the recent times. 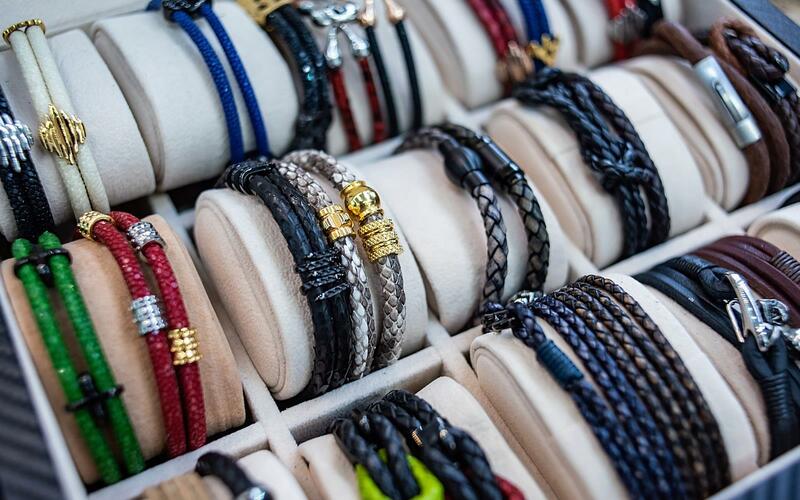 Leather bracelets come in a variety of styles and are furnished in a variety of fashion, it finally depends on the men as to which style they would want to choose for themselves. Let us have a profound look on the history of the evolution of leather bracelets in the fashion arena. It is always good to complete a profound home work regarding something which we are going to include in our fashion wear.This knowledge is not just enough to fill up the knowledge gap in our minds but it will also assist us in making the right decisions while buying a leather bracelet.So, let us first understand the source of leather and what exactly it is. Leather is a material which is flexible and durable created by the tanning of animal rawhide and skin. It is mostly used for making bags, shoes, wallets, jackets etc. It is generally known that leather is mostly produced from he hide of cattle and goats. However, the truth review around he fact that leather is actually made from the hide of pigs, alligator, bears and deer as well. Historical researches have helped to understand that human beings have been using animal rawhide since the Palaeolithic ageor most commonly referred to as the Stone Age and they used it for a number of reasons including clothing or shelter.Therefore, along with the advancement in the ages leather came to be used in a variety of products after a long process of making the animal skin usable and this process is also known as tanning. The use of the first ever leather bracelet is quite difficult to trace and it has been seen that in the older days a leather bracelet in the wrist is used to signify the position of a person. For example a leader in a tribe wouldwear specific bracelets in the hand to imply their social strata. We had also been seeing in the ancient Egyptian age where leather was symbolically used to indicate the status of a person. For example, the eighteenth dynasty Egyptian emperor Tutankhamun wore a leather cuff as a sign of his monarchy. They were also worn by ancient Greek and Romansoldiers to signify allegiance and rank. For example, the famous Gladiator Spartacus is seen wearing a simple brown leather bracelet around his right wrist to symbolise raw power which projects string alpha male characteristics to all with whom he had an encounter. Apart form this, bracelets similar to what Spartacus wore can be found on men of modern era inspired by him to signify strength and power. Leather wrist bracelets have been worn by Native Indian men as well as according to them, these wrist lets are designed to establish a connection which is tactile with animal guides. They have a ruggedness in them and it is absolutely marvellous to see their oneness with nature. They have a lot of practicality in them and also denote a sense of calmness in the users. There is an innate strength and power in this colour and it makes the final bracelet look extremely sophisticated. It has a mysterious appeal in it which makes the bracelet look ecstatic. Also a sense of utter dominance is provided in the bracelet which makes the look and ethic amazing. This colour has a woodsy effect and the entire approach is totally nature focused bringing in much appeal. It has a warmth in it which cannot be avoided and it also brings in serenity to the look of the bracelet. It is generally believed that the wider the bracelets of leather are, the more masculine it gets. This however does not mean that the thin bracelets do not have any masculinity in them.There are three basic types of leather bracelets which have been preferred to be used by men, which are as follows and let us see as to what their characteristics are as follows. This is the most popular simple wide leather bracelet designed to exhibit strength with a hint of edginess. There are many other men who wear this give off a sexual vibe as well. Popular in the 70s, we have seen a resurgence in leather cuff wrist bracelets made of leather containing intricate artwork. Sometimes, some are studded with intricate embellishments as well. Many men like design bracelets because that provides an element of texture and style. There will mostly be embroidery on dark green and brown wristlets. Some of such wristlets have embellishments like edgy metal hangings, skulls, anchors and zodiac signs embellishmentsembedded in them. We can always see that the embroidered bracelets come in narrow and wide strips of leather. However when we look around, most men opt for the wide leather bracelets, like the bangle bracelet, because it looks super unique and stylish in them. The most popular type of bracelet which is extremely prevalent among the young men. These are mostly with guys who want to send a subtle yet stylish message. These bracelets however signify special relationships like friendship and dating and exhibits a cowboy style look which is a hot favourite among the men. Different men have different wrist sizes and in order to create a wonderful and appealing look, we need to have the worst sizes and the leather bracelets in order. For men who have a small wrist, any bracelet type can be chosen which totally blends into the look and does not look awkward and odd. Those who have a medium wrist, they are very lucky and any type of leather bracelet looks good on their forearm. Men who have large wrists are the ones who have lots of option in leather bracelets as they need to have a bracelet that is proportional to their wrist size. It is just not enough to buy a leather bracelet and flaunt it or keep it away in a closet. It needs to be taken good care of and so, we must take appropriate measures to preserve the leather bracelet. While we were the bracelet everyday, the oils and moisture from our bodies can be harmful enough for the leather. It can cause an unpleasant odour to be emitted from the product. We should never take a bath or make the hand wet while wearing leather bracelet as it might cause the bracelet to shrink. For the preliminary clean up we can use a cloth to wipe the leather in order to remove surface dirt, dust or other debris. This will help to prevent granules from scratching the bracelet during the cleansing process. We can also use specially made leather cleansing wipes for this part of the process. We can also take a fresh cloth and get it wet with lukewarm water. After this we pump out a few drops of moisturizing liquid soap and create suds.We clean itand be absolutely sure to clean both sides of your bracelet and not just the outer part.Now we finally takea clean cloth and dampen again with warm water wiping off the excess soap. We can layour leather bracelet down on a paper towel and allow to air dry away from direct sunlight. Overall, we’ve discussed about how earlier bracelets were used and how they’re used now based on colour, symbolism, colour and wrist size. Few simple tricks are also shared to keep your bracelet clean and dust free. Let us know in the comments if you’ve any questions regarding leather bracelet. Finally, From Where You Can Buy? All come with a one year warranty and hand-crafted from finest leather to Riblor exacting standards. Trust us, Riblor will takes you to next level of fashion. Click here to be taken to the new Designer Leather Bracelet.